Far Cry 5 has a downer of an ending. You're faced with two options. In the first, you decide not to confront The Father, the vicious cult leader who has closed off Hope County, Montana and murdered its citizens to save them from the Great Collapse. In the second, you fight The Father and arrest him, only to see the Great Collapse he was predicting play out in front of you. The game ends with you and The Father, alone in a fallout shelter, as a nuclear war continues above. 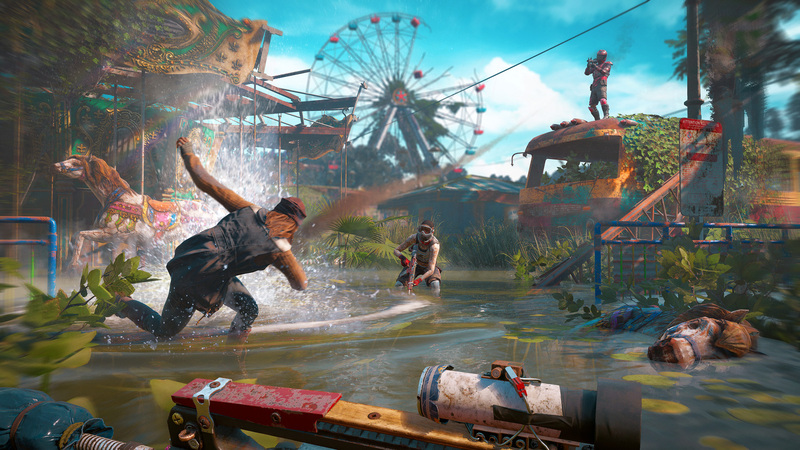 For the first time in the franchise, Far Cry New Dawn is a direct sequel to the previous game. It's quite similar to 2016's Far Cry Primal, with a shorter development cycle and lower price point ($39.99), using parts of the previous game. "We were searching for the ending of Far Cry 5 sometime ago. We were hesitating in-between different scenarios, but the doomsday scenario was one of the most appealing. And we realized that we wanted to do a post-apocalyptic Far Cry. So we had the opportunity to finish one in a quite a dramatic situation, and at the same time set the table for another one set in the post-apocalyptic era. 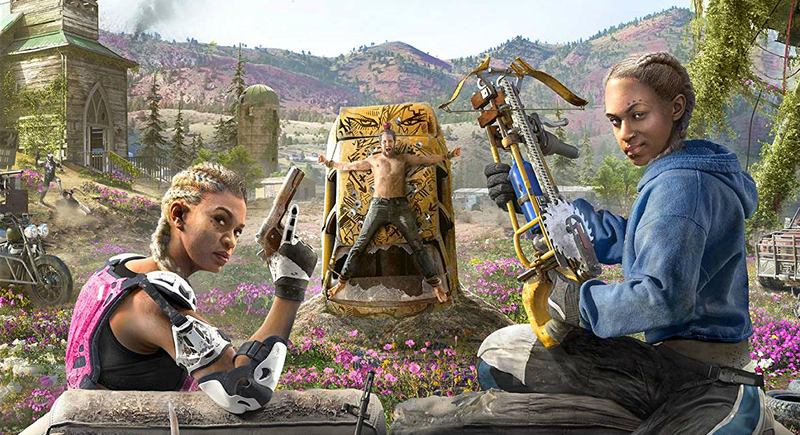 So it's like killing two birds with one stone," explains Far Cry New Dawn creative director Jean-Sebastien Decant. Ubisoft tends to spend a lot of time researching the backgrounds for its titles, even if many players don't always engage fully with the little details. 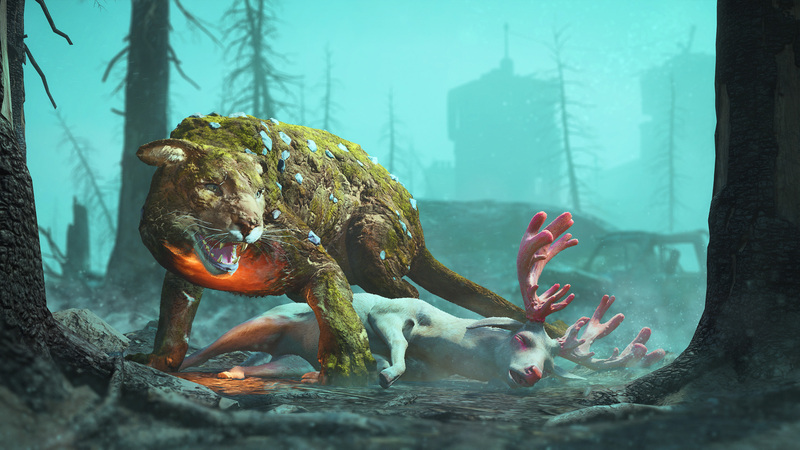 For Far Cry New Dawn, the team spoke to meteorological experts about nuclear winter scenarios. 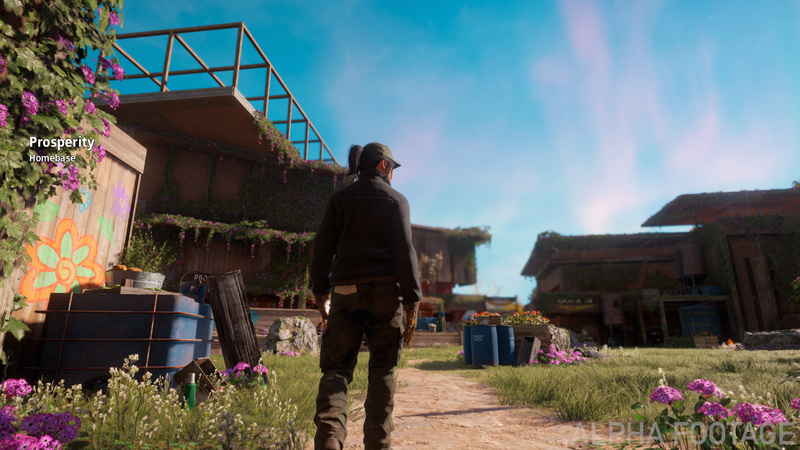 These experts have worked with the U.S. government and military to plan for various outcomes, and Ubisoft relied on them to refine their model of Hope County. The combination of nuclear winter and storms akin to the 1930s Dust Bowl have changed the original face of Far Cry 5. Seventeen years after the Great Collapse, Hope County is a very different place. It's post-apocalyptic, but not entirely in the way we'd normally expect. Instead of the broken, endless desert of something like Mad Max, Far Cry New Dawn presents a Hope County long after the ravages of nuclear winter. After the dust storms have changed the landscape, it's the same map, only now with a new lease on life. Ubisoft is leaning heavily on what it calls "super bloom," a real-world phenomenon in which barren regions can experience a burst of new life. "I was obsessed with one thing: I wanted a colorful and inviting post-apocalypse. I wanted a world where you could spend hours and be surrounded by a beautiful setting. So that was the starting point," says Decant. What immediately stands out in Far Cry New Dawn are the bright colors. The super bloom has led to fields full of flowers exploding in neon pink and blue. Hope County was full of animal life, but that life has changed in New Dawn with pale deer and cougars with a thick layer of moss covering their bodies. 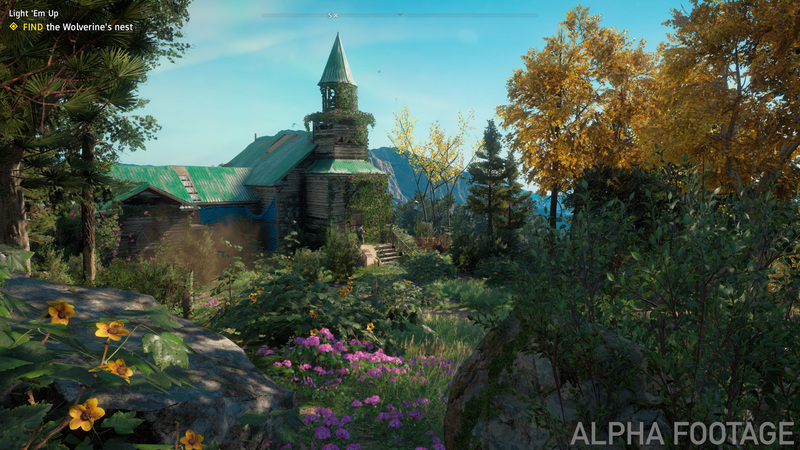 The vestiges of the old world, and the landmarks of Far Cry 5, are all different now too, covered in overgrowth and layers of soil. 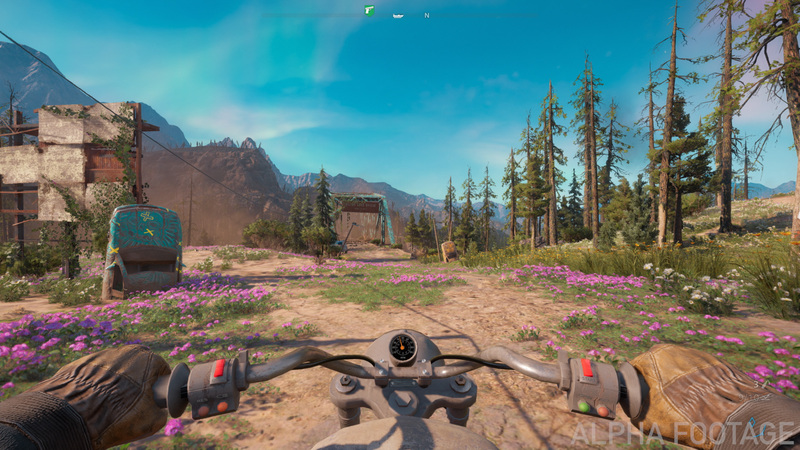 Overall, New Dawn takes place in one portion of the original Far Cry 5 map. While the Western side is fully encompassed by the new growth in plant life, the Eastern side is more like the barren landscapes you'd expect from other post-apocalyptic fiction. Ubisoft wants to show off your character in more cutscenes in Far Cry New Dawn. In New Dawn, you step into the shoes of a new character; a faceless, nameless person who is part of a group that is looking to revitalize and rebuild the shattered United States. 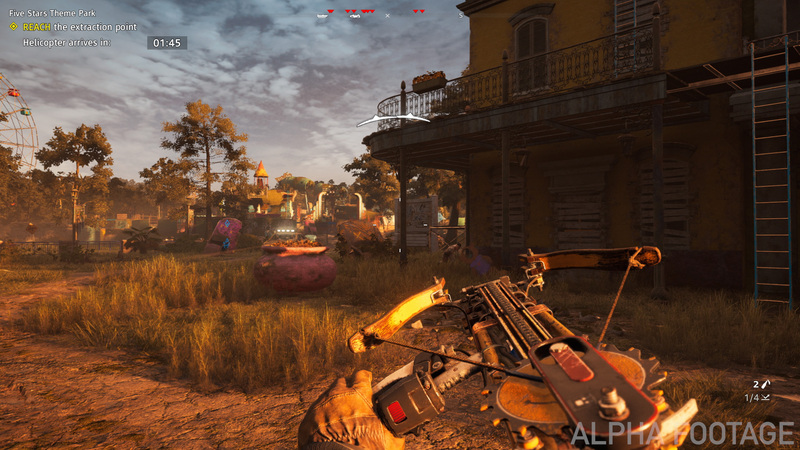 Your group is traveling by train when you're attacked by Far Cry New Dawn's antagonists, The Highwaymen. You're the only survivor and you find yourself in Prosperity, the new hub and home base of New Dawn. Eagle-eyed fans of Far Cry 5 will notice that Prosperity is John Seed's Ranch from the previous game. 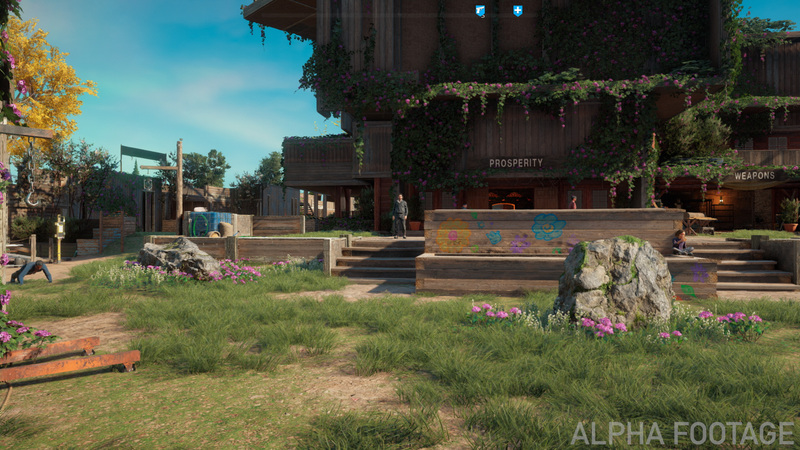 Hope County's survivors have rebuilt their society around the compound, with new makeshift buildings, farms, and defenses. Prosperity is a happy place, but it's one that's just getting by. As you play, you build up the base more and more; Decant calls Prosperity "the root of the progression of the game," and improving it will trigger certain events in New Dawn's plot. Improvements come from gathering materials, including the new ethanol fuel you need for your vehicles, and meeting with new Specialists. Like Far Cry 5's Guns For Hire, Specialists are a group of folks that you'll meet out in the world that you can recruit and bring back to Prosperity. Each Specialist has a core focus in the camp, and by completing further missions for them, you'll continue to upgrade your little town. "Prosperity in general is something brand new to the franchise. Your goal is to bring back life into Prosperity. When you first get there, there aren't that many people, but as you progress through the game, you really bring it back. There's gonna be children all over. They're fixing their architecture. They're repainting. 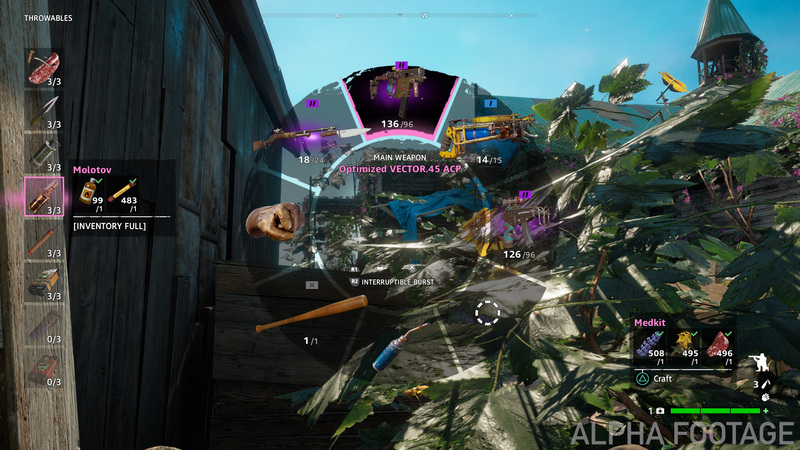 So as you progress in the game, Prosperity evolves visually and that's something we really wanted the player to see as they play our game," says Far Cry New Dawn art director Issac Papismado. Players will see returning characters from Far Cry 5, but there will also be new characters for players to meet. There are a total of six Specialists and six Guns for Hire that form the core of your progression, but other characters will make their presence felt around Prosperity. One of them is Carmina, the daughter of Nick and Kim Rye, a character players of Far Cry 5 might have met as a newborn. 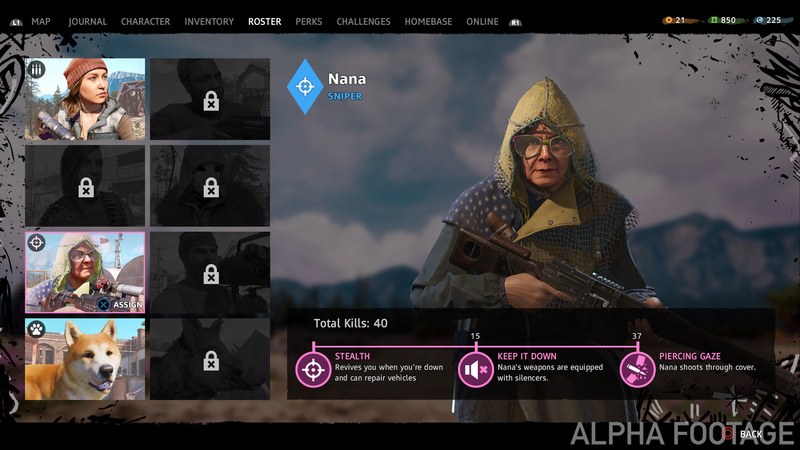 Another survivor is Nana, one of the Guns For Hire and Alexander's favorite character in New Dawn. Nana is your sniper, a former extreme tourist guide who knows the woods like the back of her hand. She brings "some grandma energy" to your crew, while also putting bullets into heads. Nana has "reached that very special age in someone's life where they just don't give a crap about what they say anymore." "Not everyone survives. There are people in Hope County that very much carry along the spirit of the place with them. Carmina as a character is very interesting because she is a bridge between those two kinds of people: young people for whom this is the only world they know and surviving people who may or may not have very clear memories of the world before and have mixed feelings about the beautiful, but difficult place that they ended up in. Carmina has a lot of drive to improve that world she's in. Survivors from before the event feel like they've only got a couple inches and she thinks they've gone miles," says Far Cry New Dawn writer Olivia Alexander. There are also two Fangs for Hire in New Dawn. The first is Timber, an Akita that replaces Boomer as your dog companion. Timber is a happy little scout, and Ubisoft has addressed a big complaint with Boomer: Timber can jump into vehicle and ride shotgun, instead of being left behind. The other Fang For Hire is Horatio, a giant mutated boar that can run alongside you as you go tearing through the world in a vehicle. And for those who are wondering, The Father will return. Alexander didn't offer much in the way of details about the archvillain and your character from Far Cry 5, but they will factor into New Dawn. Far Cry: New Dawn is a sequel to Far Cry 5, but you don't need to have played the previous game to play this one. Instead of the Project at Eden's Gate doomsday cult, you're fighting against the Highwaymen, a roving band of marauders with a motocross aesthetic. They moves from settlement to settlement, taking resources and killing anyone who gets in their way. 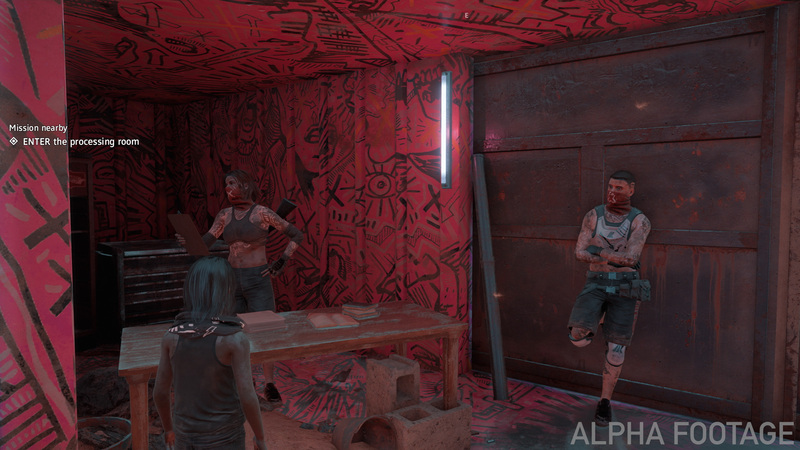 "So you have the people of Prosperity, the people of Hope County who have kind of hunkered down in Prosperity to defend themselves from this oncoming threat. The Highwaymen have their own philosophy about what this world is and it is in direct opposition to what the people of Prosperity think it is. While they plan for the future, the Highwaymen live only for today," explains Alexander. The group is lead by Far Cry's newest villains, the Twins. These two young women stand at the head of a gang their father created, one they inherited by killing the man after he strayed too far from its ideals. The Highwaymen live simply for the moment, and for winning. Everything else is immaterial. The Twins aren't played by actual twins, though Ubisoft did see some twins in the open casting call. Actresses Cara Ricketts (Xenia from Assassin's Creed Odyssey, Sayla in Far Cry Primal) and Leslie Miller are portraying the pair. The Twins set the stage for the Highwaymen. The gang stands at the top of the food chain, with motocross armor covered in animal bones and intense graffiti. The graffiti, also painted on derelict vehicles, is a marker of Highwaymen territory in New Dawn; if you see it, you know there's an outpost just over the horizon. "While we were designing the Highwaymen, we really wanted them to have a strong visual identity. So I knew right away that graffiti was something we wanted to add and bring to the table for them. It was really tough to find something that we really fell in love with," says Papismado. One member of the team offered up a local Montreal graffiti artist to Papismado. That artist, Zilon, is a local legend among the Montreal graffiti community. His graffiti is the core of Highwaymen's look: very sketchbook-like, strong, and in-your-face. "As you can tell, he has a really distinct approach to his graffiti," explains Papismado. "It's very aggressive. It's very interesting and the more you look, the more details you find. That's something that we really want to leverage. The moment we put it in our game, it was like a match made in heaven. When he came to our studio, he was like a kid in a candy store. He was so happy and it was really a great moment." Since we're no longer at the height of civilization, there are no weapon shops anymore. Instead you have to craft most of your weapons, or earn them in missions. "It's all signature weapons. So once you've crafted it, it's there. You will be able to invest more resources in it to increase damage that the weapon can do, but you cannot mod it. 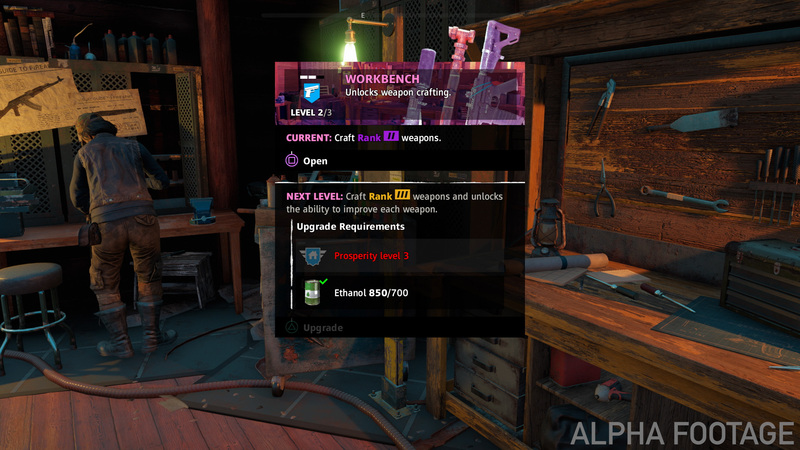 A lot of changes are attached to the weapons, so if you want to get Perk Points, you will have to try out the different weapons," says Decant. There's a new weapon wheel and quick crafting interface! Crafting new weapons around the camp. According to Papismado, every weapon is unique. During our demo, we were shown various weapon silhouettes split into three different levels. Yes, Far Cry is embracing a somewhat soft level system. Each of the crafted weapons fits into one of the three levels; you can upgrade the weapons with resources, but a Level 1 weapon won't ever become far better than a Level 2 or 3 weapon. Enemies also retain a level badge next to their health bars, with visual signifiers like improved armor otherwise letting you know what you're up against. It's not a hard leveling system like Assassin's Creed Odyssey or Origins, but Ubisoft wants to encourage players to use more weapons, rather than picking up a starting assault rifle, adding a scope and silencer, and calling it a day. "If you're in a room and you have a Level 1 gun and then you're in front of a Level 3, it's going to go very wrong for you," says Decant. "But if you're in the open world and you have explosives, a vehicle, Fangs For Hire, and a bit of luck, yes you're going to be able to take care of them. There is hope in Hope County." As a side effect, the skin system from Far Cry 5 is gone. Each signature weapon has a look that can't be changed. Another side effect of the new soft level system is that shooting enemies actually shows damage numbers, somewhat akin to Gearbox's Borderlands series. New Dawn is not an RPG and there aren't scores of loot weapons dropping from enemies, but weapon levels are something you have to keep in mind now. Decant admits that he was originally not onboard with the idea, but he was ultimately convinced once it was added in-game. "We wanted to change the approach on how people were handling their guns in the previous games. We wanted to have the enemies be alive for a longer time, while being believable. You could understand the level of difficulty of the enemy just by looking at them, but something was missing in terms of information. And then some of the designers, they tried out the numbers," says Decant. "I was not for it at first, because I felt it would break the immersion of the Far Cry experience, but I tried it. 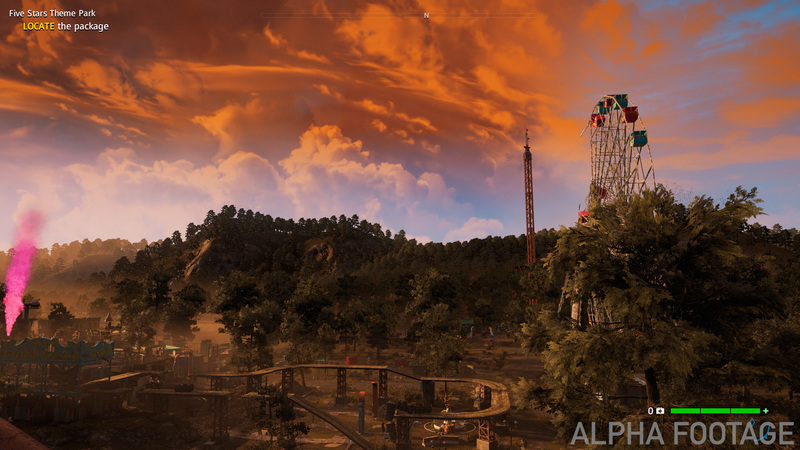 It adds to the fun and it actually raised the bar in terms of manic situations in Far Cry." If you want to craft the best weapons, you're going to need to take on Highwaymen outposts. 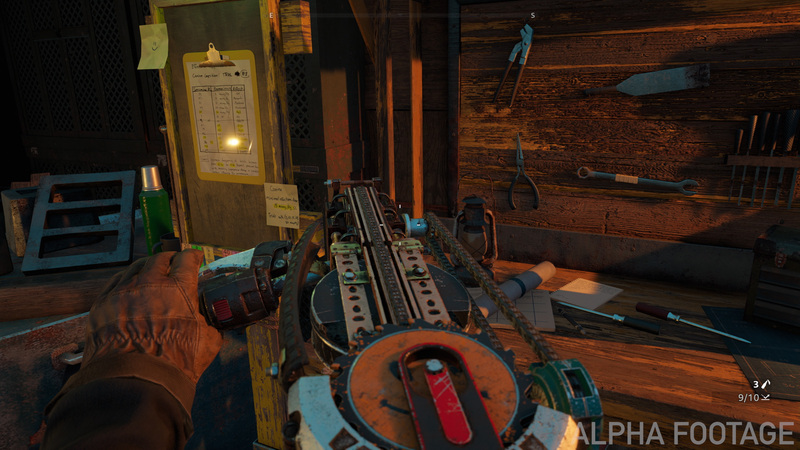 Far Cry New Dawn features fewer outposts than Far Cry 5, but each outpost is a bit more complex, with multiple entrances. Taking an outpost makes it friendly and offers resources. If you drain it of resources and leave it alone though, that outpost will actually be retaken by the Highwaymen in a system Ubisoft is calling Escalation. When an outpost is retaken, the security is upgraded and more guards of higher levels are added. If you complete these upgraded outposts, then you'll receive better rewards and materials for your efforts. Outposts have a total of three levels, thought Decant notes that Level 3 outposts are "really for either completionists or people that want to have a good challenge with a friend." There's a new Hope County to explore, but Ubisoft did a lot of research for a small area of the United States. 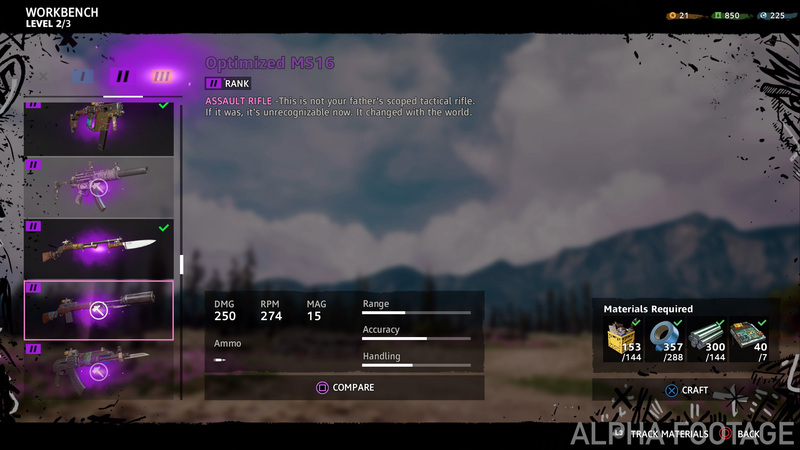 There's a new mode called Expeditions that expands the scope of Far Cry New Dawn a bit, allowing players to visit other regions of North America. In Prosperity, you'll find Roger, an excellent Canadian helicopter pilot who maintains his ancient flying beast. With his help, you'll take on the Highwaymen in other settlements and locations. Ubisoft showed off teases of the three Expeditions that will be available in Far Cry New Dawn. The first is the derelict Five Stars Theme Park is Louisiana, surrounded by a deadly swamp. The second is a reimagined version of the Navajo Bridge in northern Arizona, which has been turned into a small town. The final Expedition takes players to an unknown beach location on the West Coast. The Expeditions take place in discrete maps, allowing Ubisoft to try something different with level and enemy composition. "We're bringing players to unique locations with their own unique settings, new biomes, and also new wildlife," says Papismado. "We wanted to find unique locations that were completely opposite of what you were experiencing in Hope County." In the Expeditions, your focus is to infiltrate a location, take control of a cache of resources, and then bring those resources to an extraction point. Like the outposts, the Expeditions have three different levels, offering better rewards as you move higher up the ladder. Each Expedition map changes its spawn point, cache location, and extraction point as you move up the ladder, once again offering harder foes. They're not meant to be played from launch until the end of time though, unless you want to jam with your friends. Unfortunately, it doesn't look like Ubisoft will be adding further Expeditions to Far Cry New Dawn. "For this $40 offering, we're concentrating our efforts on re-creating Hope County after the events [of Far Cry 5] and then having some of these Expeditions. That's the package," says Decant when I ask about future Expedition offerings. Far Cry New Dawn is a series of firsts for the Far Cry franchise. It's the first post-apocalyptic Far Cry. It's the first direct sequel. It's the first Far Cry game to showcase a female villain. Like Far Cry 3: Blood Dragon and Far Cry Primal, this is more of a middle release for the franchise, rather than the next full step. It's nice to see a post-apocalyptic game with a splash of color and life to it. 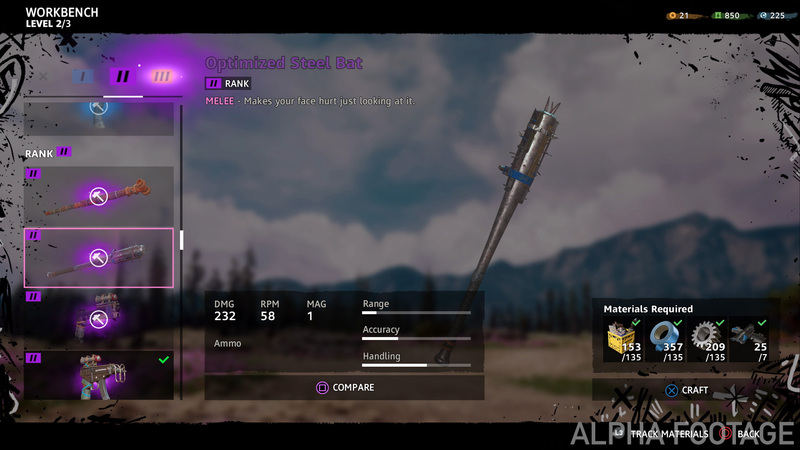 And the new weapons in Far Cry New Dawn feels a bit farther out there, even if Ubisoft is trying to make sure they're realistically functional. (No one is running on a battlefield with an open circular saw on their arm.) I didn't get my hands directly on it though, so it remains to be seen if all of Ubisoft's promises will come together in the final product. Far Cry New Dawn is coming to PC, Xbox One, and PlayStation 4 on February 15, 2018. Editor's Note: USgamer is pretty poor and we were invited to Ubisoft Montreal to look at Far Cry New Dawn on Ubisoft's dime. If this colors your view of the preview, so be it. We just wanted to let you know! Tagged with Action Adventure,	Opinions,	PC,	PlayStation 4,	Ubisoft,	Xbox One.